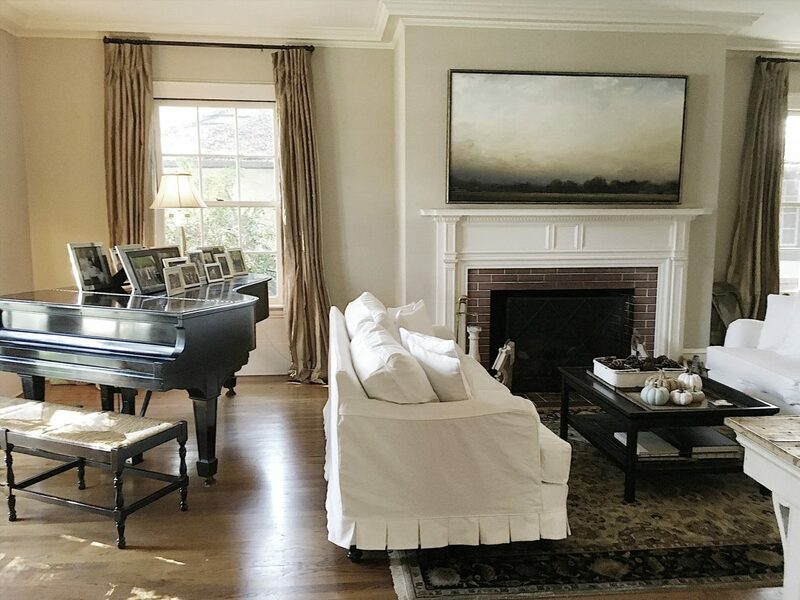 One of the most frequent questions I get asked is “where did you get your living room couches?”. The truth is that I bought the couches about 15 years ago. And they were nothing special, I promise. But last fall I ordered a new slipcover for a lot of my furniture. And now I love my slipcovered couches. Especially the pleated ruffle! You may not know that I have enjoyed sewing my entire life. I use to make coats and suits and all of my clothes. But then I had three boys and my sewing skills were confined to Halloween costumes and home decor. Sadly, that’s the truth. But slipcovers? No way. They just seemed daunting and really hard to make. I hired our local upholsterer to make these and fortunately, I really like how they turned out. But ever since I put those slipcovers on our couches I have been thinking that I could probably make my own. I searched youtube and watched a lot of videos about slip covering. But the process looked really hard and the finished projects were ok, but not great. 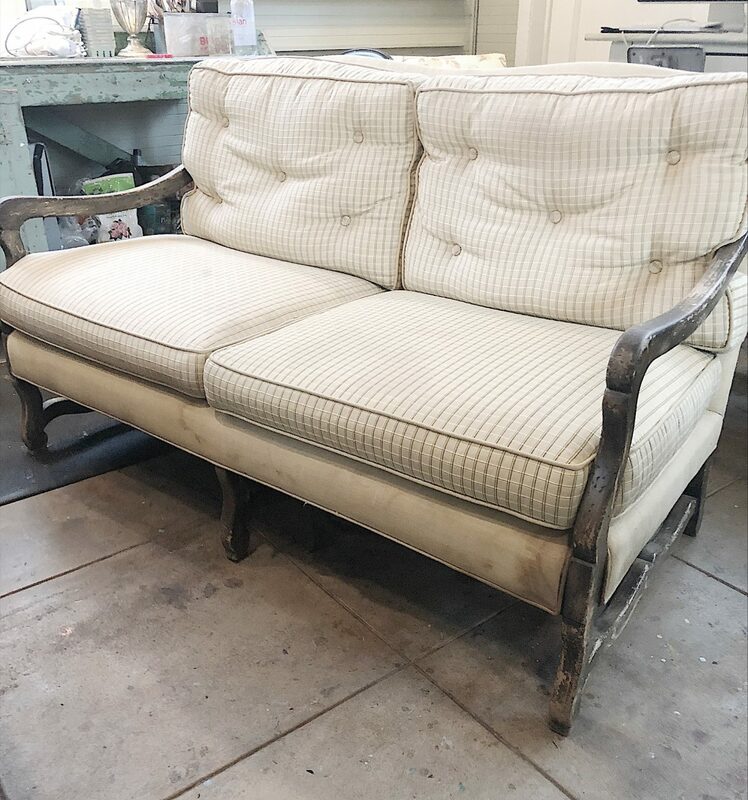 A few weeks ago I was “junking” and I found this wonderful couch. It was $50. But, the fabric was yellow and soiled. 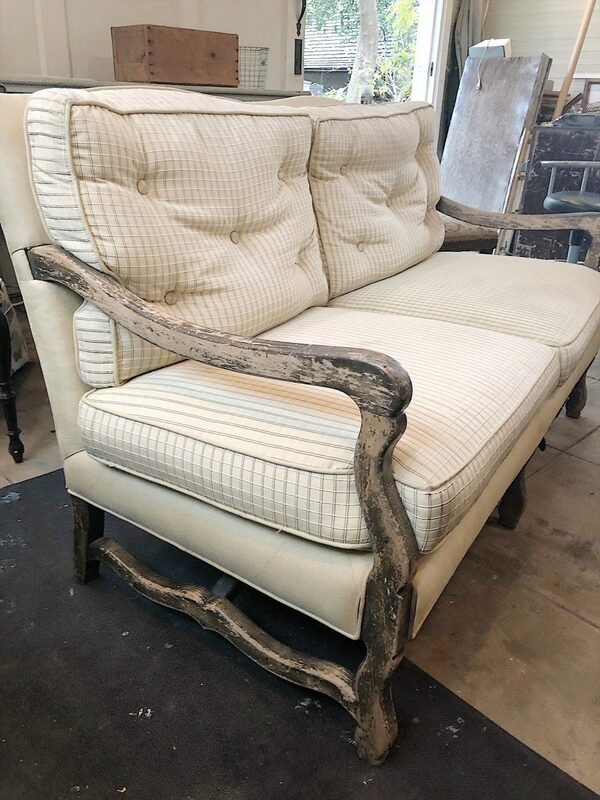 And even though the arms and legs are wood, I thought a pleated slipcover would make this couch fabulous. I ended up buying the couch. I mean, seriously, it was only $50. And my friend Judy had her truck so I could even get it home! I decided to make one more attempt to find a good video that explained how to make a slipcover. And I struck gold. Lisa from Farmhouse on Boone has a fabulous blog and youtube channel. I think I have now watched all of her videos. The videos on slip covering I have watched a few times. Ok, more than a few of times. A lot of times. I love Farmhouse on Boone. Lisa makes her slipcovers without a pattern. And she works fast and has a very simple method. She doesn’t worry about being too precise. She measures with the fabric (instead of a tape measurer), rips the fabric, and makes the pattern right on the couch or chair. The difference is that her slipcovers look great. Plus, she uses piping and great fabric. In fact, the fabric she uses is a drop cloth. She buys the all cotton canvas ones from Amazon and bleaches them so they are softer and whiter. And they are really inexpensive! I already bought my materials. 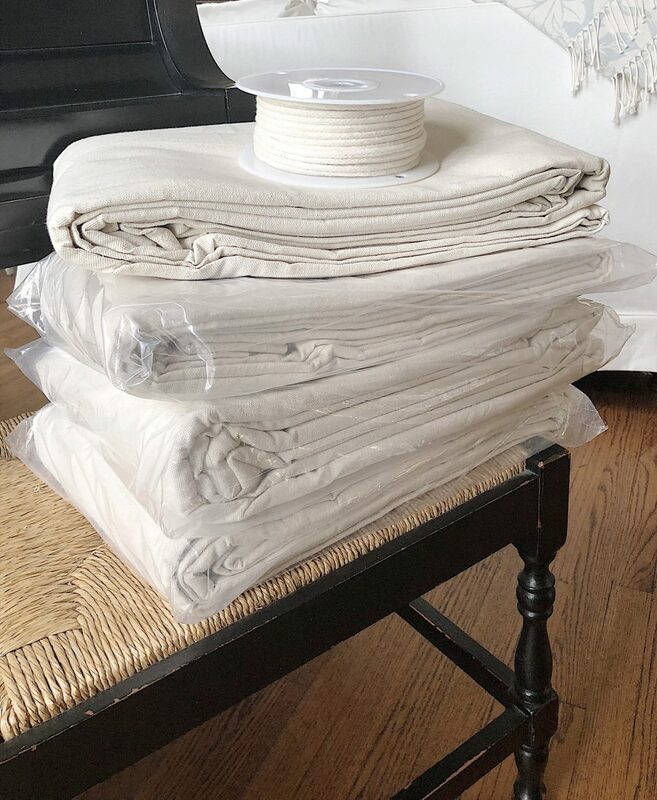 I have a few projects planned so I bought plenty of drop cloths. Lisa at Farmhouse on Boone has three key videos. The first one is how to bleach the dropcloth. Then you need to watch the one on how to make piping. 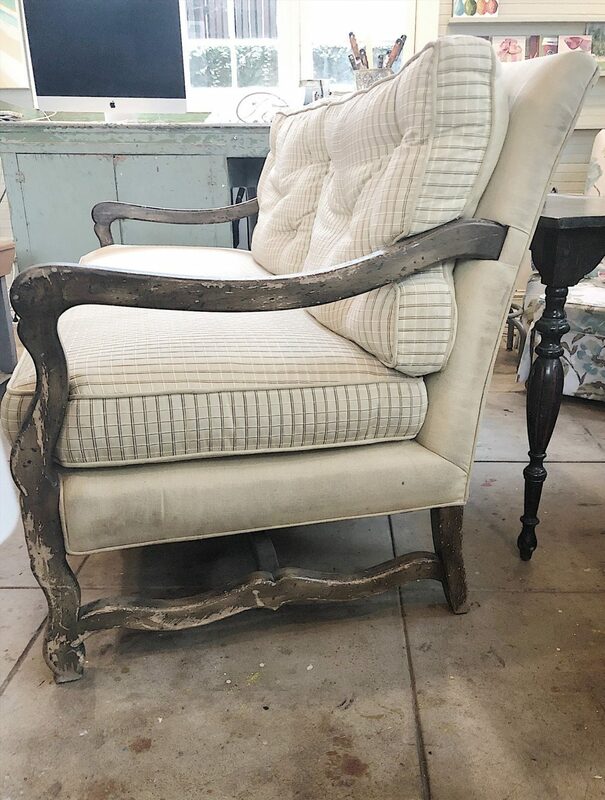 My favorite one is her video on how to slipcover a wingback chair. If you have any interest in making a slipcover you need to watch all three of these videos. Just so you know, my dropcloths are soaking in bleach as I type. Tomorrow I am going to make the piping. And then I will start the slipcover this weekend. I think I will finish it this weekend too. Am I nervous? Yes, I am. But I think it’s going to be ok.
Good luck! I can’t wait to see the finished slipcover???? Can you please post a link for the drop cloths you purchased? Thanks! ???? That couch is a treasure!!! Can’t wait to see what you’re going to do with it!! I am amazed at your talents Leslie! I love to sew too but slipcovers!!! So daunting!! I can hardly wait to see your finished product!! What kind of sewing machine do you have? What would you recommend for such a project? I too have always wanted to make my own slipcovers. I will definitely check out her videos! You are so inspiring. I love the way that you fearlessly tackle your projects. You can do it!! I need to do this! Please let us know how it goes. Good luck. I have a love seat and a one and a half loveseat I so badly want to do this with him when I was sick this past week literally on the couch I kept staring at them last night at 11:30 I move them hoping that was part problem it isn’t I need to recover them and you’ve given me Courage to do so. I have no excuse my sewing machine is just been gone through I have a wonderful walking foot that will help with the sickness and I have YouTube’s now to help me through the process I think we can do this!!! can’t wait to see your slipcovers!! I have something wanting to make too .. really appreciate the info too!! You can do it! I made one from drop cloths a few years back. I used a @missmustardseed video. I can only sew a straight seem, so it will be easy for you! You can definitely do this!! I can’t wait to see the result! What a great $50 score!! I love this idea, but how do you clean the cushion itself? I’d worry the yellow and dirt might be inside it as well…???? Or maybe you’ll be changing out the insides too? Did you make it last weekend? I tried but it didn’t work so well! Ugh. Can’t wait to see your finished couch! If you can make a suit you can definitely make a slipcover! Not hard just takes awhile especially when you make piping.